Christmas is my favorite holiday. Even as a young child, I waited impatiently for this magical season to arrive. I call my husband "Clark Griswald" during the holiday season, because he loves Christmas just as much as I do. Our son is 3, and every year becomes more and more exciting. He is understanding the whole Santa Claus thing and getting into all the Christmas magic. Last year, Santa sent a special elf to spend the holidays with us. My son, at 2 years old, named him Mee-Mee. Maybe not the most thoughtful name, but cute none the less. Mee-Mee is an interesting little elf. He looks over us all day long and watches every little move we make. (kinda creepy). When we sleep, he flies all the way to the north pole and reports our behavior to Santa Claus. Before we wake, he flies back home and "usually" positions himself in a new spot in our home. In the morning, my son searches the house until he finds him (the fun part). The only important rule is to not touch him or he could "loose his magic". Simple enough. When Christmas Eve comes around, he flies back to the North Pole with Santa until next year. Do you know what's crazy? I actually miss him. He's only been gone for a few days, but I miss his creepy little elf eyes looking at me like I've done something wrong. I'll get over it. See you next year Mee-Mee! The Scene: I was inspired by the elves in the inspiration picture. The Scheme: I used all five colors. Evidence: I used stripes, arrows, holiday accents, decorative borders, string, branches, and labels. 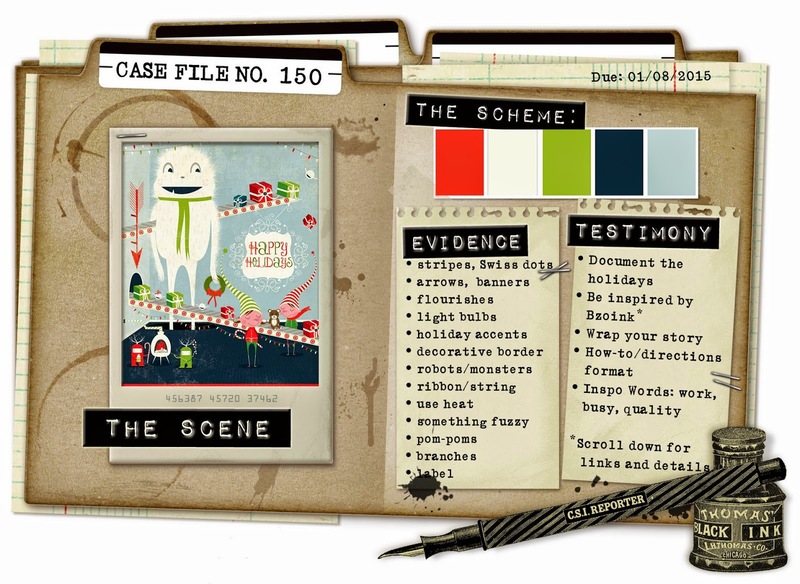 Testimony: I documented the holidays and wrote my journaling in a How-to format.